Feeling Lost or Need Direction? Have you ever felt lost or alone and then thought, ‘what do I do next’? Maybe you had well laid plans and now things seem to be falling apart. It could be that your career, health, relationships or financial situation has taken a turn for the worse. If this is you … read on. The truth of the matter is, there are times when we ALL feel alone and somewhat insecure. It is called being human. When things take a turn for the worse, it’s easy to question God, blame Him, lose faith and wonder how things will end up. – God is always there to guide us. – He is God and can make a way where there seems to be no way. – All we have to do is to be still and trust in Him. – can you still trust Him? – can you seek Him even when you don’t feel His presence? – are you willing to leave things in His hands, trusting that whatever He decides will be in your best interest? Whatever you are going through right now, make sure you spend time with God. Don’t give up on Him. There is a way out and He can point you in the right direction. If you are feeling lost or need direction, all you have to do is ask Him. I love this song …. it was tailor made for those who need clarity and wish to do God’s will. Listen … and be blessed. The constant thing about seasons is that they always change. Depending on where you live, you will experience either the Rainy and Dry season or Winter, Spring, Summer and Fall. Our Christian walk also has seasons and there are times when we do not feel close to God. This can be magnified when we lose something important (e.g. job, money or a loved one). It’s like the goal posts shifted and God moved along with it. In times like this, the devil discourages and tries to stop you from praying to or praising God. Dark times are when you need the light of God most and if you have difficulty praying, get into His presence with good worship music. If you are going through a dry spell, let this song minister to you. Dry seasons are particularly tough because things do not easily flourish BUT they are also times of preparation, strengthening and refocusing. All I can say is NEVER stop praising God. Open your mouth and He will fill it with goodness. Shout to God with a voice of triumph. Paul and Silas praised their way out of prison and you will break out of your ‘prison’ through praise. Create an atmosphere of praise, in and around you, and He will meet you at your point of need. Where is God? How could He allow this to happen to me? Does He not know what I am going through? There are times when life seems so unfair and you feel you have been left on the dust heap. When it seems like no one (not even God) cares, it’s easy to start questioning your faith and wonder if God is real. – Gods’ plans for you are plans of peace and not evil, to bring you to an expected end. If you are going through a difficult time, let the words of this song minister to you. Turn over your issues to Him in prayer and believe that He will meet you at your point of need. If possible, find someone you trust and ask them support you in prayer. Do you remember the song ‘We Are The World’?. Due to the famine in Africa, Forty-five predominantly U.S. artists, led by Harry Belafonte, Kenny Rogers, Michael Jackson, and Lionel Richie, recorded this huge hit single in 1985, thus providing money and drawing attention to the famine. If you don’t remember the song, here goes! I love this song, love its sentiments, but that is not the purpose of this little book. When I initially saw the video, I wondered how these busy superstars were able to sing in such harmony? You see, it looked like they had just met, been given a script they were still singing from and voila, out came this awesome song. Wrong! Nothing in life is that easy. Even the worlds biggest superstars have to practice and get things right. We normally see the finished product but behind the scenes a lot goes on – there was a lot of studio work. Watch this video to see what I mean. Michael Jackson, then the biggest superstar, had to spend time working on his vocals. His solo piece in the song lasted approximately 25 seconds (I timed it) but as you can see from this video, he spent over 10 minutes, most likely more, working on it. My question to you is: what are you doing to develop your talent? are you spending time refining your gift? All the folks we admire, who make things look easy and effortless (from sports to academia), have done the hard work already, so when they turn up … its show time. Watch the two videos again and ponder on the 10 plus minutes rehearsal for a 25 second solo. Jesus did something similar – He spent 30 years in ‘obscurity’ preparing for the last 3 years of His life … and these were marked by miracles, signs and wonders. Practice makes perfect and the times spent sharpening your skills ‘out of sight’ can make you seem like an ‘overnight sensation’. That’s David’s story … by killing lions and bears in obscurity, he was able to defeat Goliath publicly. I hope this encourages you to spend more time on your purpose, so that when your time comes you will fulfil purpose and leave a legacy. Ever been at a crossroad and had to make a choice on which path to take? It could be whom to marry, what job to take or something simple as what piece of furniture to buy. 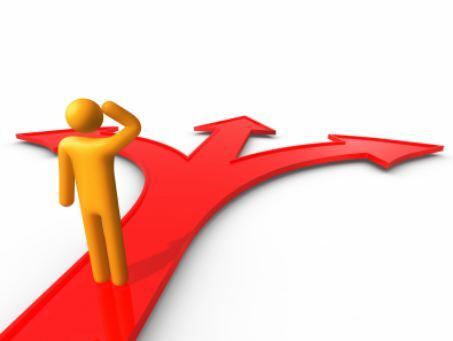 If you will have to make any important decision soon …, read on! The KEY to making wise choices is to let God lead you in any decision you make. A big part is trusting God and giving Him the permission to choose what is right for you … and it’s possible you may not initially like His choice for you. This is called submitting to His authority and believing that He knows best. Look at a parent and child relationship – a child wants everything he/she sees but as a parent, you know what the child needs right now. A 7 year old may want to drive a car but a wise parent will give that child what is age appropriate e.g. a bike. As the child matures, the other desires are fulfilled. Several years ago, I came to the realization that God is FOR me because on many an occasion, God saved me from myself. He saved me from my own poor choices, righted my ‘sinking ship’ and placed me on the path to success. As a result, I have no problem praying according to this verse in Proverbs 30. Being able to pray according to this verse is essential if you want God to rule and make wise decisions in your life. Praying this verse effectively gives God the authority to say NO to my own desires and YES to the future plans He has for me. It puts Him in the driving seat to determine what is good for me and because I know His thoughts for me are thoughts of peace (Jeremiah 29:11) I can rest assured that all things will work together for my good. God knows my future, so He knows what type of spouse I need, what career and personal experiences I need to have and even where I should live at each stage of my life. So each time before making a decision, I humble myself and take time to reflect on His word and promises to me whilst acknowledging that I do not know it all. Do you sometimes go for things that may just not right for you but have become a ‘must have’ because others have it. Are you living beyond your means due to peer pressure or keeping up with the ‘Jones’s’? Are you dating the wrong person or engaged in certain behavior, just to be cool and fit in? The first thing to do is pause and ask why you are doing what you do. The next step is to ask yourself if these choices are leading to a fulfilled and balanced life. If not, then its time to change how you make choices and ask God to ‘feed’ or give you what is convenient for you. How do you do this? It’s by saying a simple prayer to God on anything that bugs you. Looking for a job? Pray that God will give you a JOB convenient for you. Looking for a house? Pray that God will give you a HOUSE convenient for you. Looking for a spouse? Pray that God will give you a SPOUSE convenient for you. Looking for X? Pray that God will give you an X convenient for you. It’s always better to get what is right for YOU rather than what looks good on someone else. Don’t live your life or fight your battles using someone else’s tool. (Ps. David did not fight Goliath with Saul’s armor. He did his own thing and used just stones and a sling to accomplish a great deal). Don’t marry someone to impress your friends or buy a house in a certain neighborhood because your friends live there. What’s good for them may not be good for you. Have courage to go for what you know is God’s best for you and your future, even though others may disagree or look down on you. God must be central to all this because He created you and has awesome plans tailor made to make you the best you possible. The wisest choice you can ever make is to trust Him. He knows what you need and has already got them ready. All you have to do is trust Him to be faithful and true to His word. Listen to this song, trust God and be blessed. Being misunderstood is one of the most painful things that can happen to anyone. Not only can it cause embarrassment, but it can lead to confusion and serious issues depending on the gravity of the situation. Here’s a lighthearted look at 2 ‘confused’ people. To misunderstand is to understand incorrectly, while thinking to have understood correctly. What if you broke up a relationship, quit a job or got a divorce because of a misunderstanding? The implications of not getting things right are enormous and that’s why God tells us in Proverbs 4 to ALWAYS get understanding, no matter how much its costs us. It IS a priority. Proverbs 27:23 says we must be sure we know the condition of our families and pay careful attention to our relationships and affairs. Listen attentively to your spouse, children and friends. Don’t assume you know what they are going through or going to say … before they have said it. Also make sure you explain yourself clearly … don’t think others will ‘get it’, be able to read your mind or read between the lines. It hurts when there is misunderstanding so let us purpose in our hearts to take time to listen carefully, explain ourselves properly, clarify issues and just have a great time with others. Lets do it and be blessed. Why Jesus was born in a stable? Here is a different, i.e. non spiritual, perspective on why Jesus was born in a stable and placed in a manger. I think He was born in a manger because God wanted to make it clear to everyone, especially the shepherds, that they had identified Jesus as the right baby. Why? because mistaken identity can cause problems … just take a look at this short video. On any given night in a city like Bethlehem, several babies will be born. Can you imagine the shepherds, barging into one house after the other, trying to find THE baby, talking excitedly about the Messiah and the angels they saw – there would have been a lot of confusion in the entire city and it could have led to the wrong child being identified. God wanted the shepherds and the world to KNOW who Jesus and so He had a simple solution. Send the shepherds to a place they would be familiar and comfortable with … a stable. Well, that’s my story and I’m sticking to it!!. Can things said in a moment of anger or as a joke change your life or that of the people around you? I am sure we all know of people who have said things they wish they could take back because it led to a bad situation. There is a story in the Bible about how one man’s ‘careless’ yet ‘justified’ words adversely impacted his family … and he did not realize it at the time. To put things in context, I am going to let the Bible ‘speak’ for itself and then share a few insights at the end … read on! 18 and he drove all his livestock in front of him. He packed all the belongings he had acquired in Paddan-aram and set out for the land of Canaan, where his father, Isaac, lived. 19 At the time they left, Laban was some distance away, shearing his sheep. Rachel stole her father’s household idols and took them with her. 20 Jacob outwitted Laban the Aramean, for they set out secretly and never told Laban they were leaving. 21 So Jacob took all his possessions with him and crossed the Euphrates River, heading for the hill country of Gilead. 25 Laban caught up with Jacob as he was camped in the hill country of Gilead. 31 “I rushed away because I was afraid,” Jacob answered. “I thought you would take your daughters from me by force. 32 But as for your gods, see if you can find them, and let the person who has taken them die! And if you find anything else that belongs to you, identify it before all these relatives of ours, and I will give it back!” But Jacob did not know that Rachel had stolen the household idols. I believe Rachel died in childbirth because of the oath Jacob made in Genesis 31:32. Yes, it was unintentional because Jacob did not know she had taken the gods, however because of this oath, it’s likely he lost the woman he had worked 14 years for. Jacob was a man of God and, spiritually, his words carry some weight. As a matter of fact, the Bible says that ‘the tongue can bring death or life; those who love to talk will reap the consequences’. Let’s look at this from Jacob’s perspective. Think about this, everything was finally coming together for Jacob … his favourite wife who had been barren for so long was pregnant with a second child. He now had the wealth, the blessings and was on his way to his destiny BUT because of one rash statement, made probably out of frustration, he lost his loved one. The untimely death of Rachel will also lead him to favour her children, create rivalry, cause his other children to be jealous and, but for the grace of God in Joseph’s life, could have led to murder. While words like this may not kill physically, they may have the same effect by ‘killing’ initiative, self confidence, potential and self worth and can end up destroying that persons life. Whenever you have a choice, pause, think about the impact of your words and speak LIFE, speak HOPE into that situation.